Infants, toddlers and young children need to be supervised when playing around virtually all bodies of water, whether it is a bathtub, a toilet, a swimming pool, the ocean or even a small Koi fish pond. According to CBS Boston, a 10-month-old died after drowning in Littleton. 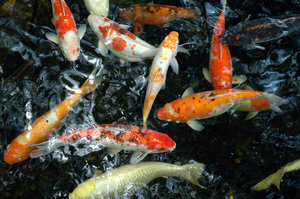 The infant died after drowning in a Koi fish pond on the family’s property. Emergency response teams found him in their Koi fish pond at their home on Harvard Road. He was already unresponsive when they found him. Firefighters arrived at the scene and pulled him from the pond. He was transported to Emerson Hospital and then later taken to Massachusetts General Hospital. He was first listed in serious condition for quite some time. According to officials with the Middlesex district attorney’s office, the toddler died just a few days after, reports ABC 40. According to the boy’s neighbors, the family is new to the area and had not installed the Koi fish pond. It was left behind by the previous homeowners. It’s about two feet deep and about four feet wide. Unfortunately, it was large enough to cause some serious injuries to the toddler. According to accident reports, there were a number of kid toys lying near the pond when officials arrived. The accident is being investigated by the Middlesex County District Attorney’s office. Swimming pools aren’t the only areas where infants are at risks for drowning accidents. They’re also at serious risks around lakes, ponds, beaches, bathtubs and other bodies of water. Every year, about 1,000 kids are killed in drowning accidents. It’s important to make sure that you secure all lakes, ponds and swimming pools when you have a young child present. It’s a good idea for you to take a CPR course specialized in helping infants and toddlers. Avoid keeping toys near any ponds or lakes near your home. You also want to make sure that children are always supervised when they’re around these bodies of water. Consider enrolling your child into a swim course to help them to get a head start. You even need to keep an eye on the bathtub. You might not think about it, but these are common places for drowning accidents to happen. -Cover the surface of the tub with a suctioned mat to help to reduce the risks of slipping. -Fill the tub with no more than 4 inches of water. -Never leave a child unattended while they’re in the bathtub. -Put a soft cover on the faucet so they don’t get hurt in the event of a fall. -Make sure water temps are appropriate for their young bodies. -Don’t allow newly potty trained children to use the restroom without supervision. -Never allow water to get hotter than 120 degrees. Any hotter can cause scaling injuries. -Never allow children to drink the water. -Keep toilet lids down and bathroom doors closed at all times.